There are no two ways about it: in 2017, Rogers and Hammerstein’s Carousel, which Opera Nuova presented on alternating nights with Janáček’s Cunning Little Vixen at Festival Place, Sherwood Park, from June 24th to 30th, is problematic. For, whereas Janáček’s opera seems all too relevant today, Rogers and Hammerstein’s Broadway 1945 music does seem awfully dated. There is a paradox here: so many of the songs are (rightly) classics: ‘If I loved You’, ‘You’re a Queer One, Julie Jordan’, and that anthem of the British soccer terraces, ‘You’ll Never Walk Alone’, to name but three, will be known to most readers of this, even if they don’t know the source. The work introduced some musical innovations (the soliloquy, for example) that have become Broadway staples, and the overall tone of the songs and choruses – tuneful, tonal, with a large element of sentimentality that rose-tints the story – picked up on Rogers and Hammerstein’s earlier Oklahoma! (which Opera Nuova presented in 2015), and has largely defined the genre ever since. So the attractiveness of the music is not in question – it’s that story that is the problem. It is almost a clinical study in dysfunctional relationships, and more pertinently what is known as ‘co-dependency’. The mill girl Julie Jordan is quite willing to give up herself and her job to the clearly ne’er-do-well fair-ground carousel barker Billy Bigelow, as she has a crush on his good looks and silken tongue. The result is almost inevitable: pregnancy, marriage, crime and domestic violence. Most notorious of all is the way that domestic violence is treated, with the horrible line, given completely uncritically in its context: “It’s possible for someone to hit you, hit you hard, and not hurt at all.” In other words, the very musical itself can become part of that dysfunction. Then there is the peculiar last third, where Billy Bigelow, having committed suicide, is given the opportunity to make amends by returning to earth for one day. However, not only does his violence flare up again as he hits his now-teenage daughter, but actually he doesn’t actually do anything that materially helps that daughter – Louise Bigelow would put the past behind her, one feels, whether he had come back or not. The theme of returning after suicide was much more effectively treated only two years later in the movie It’s a Wonderful Life, starring Jimmy Stewart. It doesn’t help that the musical framework is so appealing, and largely without a sense of awareness of the underlying dysfunction (the Hungarian novel on which the scenario is based is much darker). It is possible to present the dark side of the musical (by all accounts, the famous National Theatre 1992 production did just that), but that was not the approach of director Donna Fletcher in this Opera Nuova production. Indeed, I was reminded of J. Kelly Nestruck’s Globe and Mail review of the 2015 Stratford production, which asked whether the director was deliberately trying to sabotage the musical by playing up its such insensitive features. For here was virtually nothing dark – on the contrary, it was played rather as if it was Oklahoma! with a bright cheerie chumminess (Sondheim described Oklahoma! as being about a picnic), even in Heaven, rather than descending into the abyss (Sondheim described Carousel as being about life and death). This was reinforced by a very strong acting performance from Albertan Justin Kautz as Billy Bigelow when I saw the musical on June 28 (like most of Opera Nuova’s productions, the musical had been double-cast). He was almost frighteningly slick in his seductions, arrogantly self-confident, and his hesitations over committing murder seemed a question of self-preservation rather than of any moral scruple: his body-language expressed his up-tightness throughout the musical. Churlish in heaven, and still narcissistic back on earth, he thoroughly convinced me what a truly awful person Bigelow actually is, devoid of any redeeming features. Not that any of this, I suspect, really mattered to the enthusiastic audience, and therein lay the problem with this production. For that cheeriness, that brightness, that melodiousness was engagingly expressed by all the company, very successfully, exactly as if this were Oklahoma! No undercurrents of strong sexual urges, or the equally strong sexual repressions inherent in the musical, here, but rather, let’s fall in love and get on with it (or be a bit jealous), and what do a few blows or a murder matter. There were some fine individual performances, too: an even-keeled and well sung Julie Jordan from Krista Patton, and a particularly impressive and confident Carrie Pipperidge from soprano Britanny Rae, who had impressed earlier in one of the Festival’s vocal recitals (not to mention the Opera Nuova 2016 production of Bellini’s opera I Capuleti e i Montecchi). Mezzo-soprano Olivia Barnes was also impressive as Nettie, with a strong stage presence, fine vocal strengths, and the suggestion that she could have taken the role quite a lot further had the directorial approach been different. Just as successful was the set by Terry Gunvordahl (who had also designed the 2015 Oklahoma!). The central building blocks were upright poles of the diameter of telegraph poles, but grouped into movable modules rather like the wooden construction of the trestles supporting a pier, or the poles a fishing boat might tie up to. These modules, when combined with such elements as fishing nets strung between them, or the sails of a three-masted ship at the back, were adaptable enough to effortlessly suggest the waterfront, Julie Jordan’s house, or the murder scene. Inventive, visually appealing, and a considerable contribution to the staging. What was less effective was the amplification, which was far too loud (is this a reflection of a millennial age, risking deafness by having the volume of music in ear-buds turned up too high?). At times it was actually grating, and it did a disservice to Justin Kautz by emphasizing the tendency to the nasal in his voice. That it didn’t need to be turned up so high was shown by Krista Paton as Julie Jordan, who, in the second half at least, seemed to have the volume of her headset turned down a little compared to the rest. The result was to allow more of the orchestra, well conducted by Andrew St. Hilaire, to come across without detriment to the solo line. 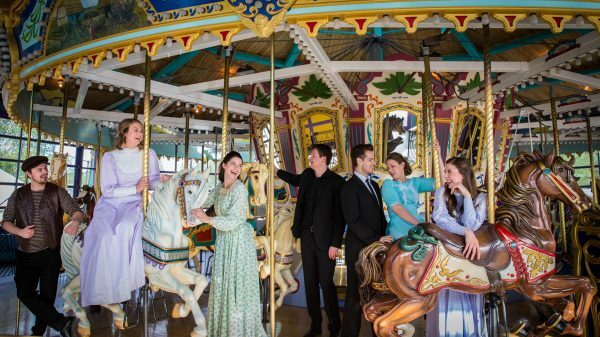 So, overall, this Carousel was something of a mixture – enjoyable performances of enjoyable music that unwittingly made one question the piece itself. This was no fault of the performers, but I couldn’t help but feel there was a missed opportunity here.